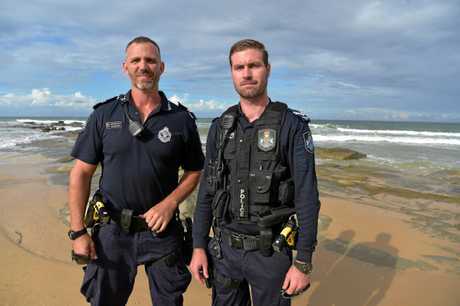 COAST cop Ben Brewster has overcome dark conditions, a lengthy struggle and his own surf inexperience to save a man who seemed determined to take his own life. Senior Constable Brewster, 41, was on patrol with partner Snr Const Ryan Woods in Mooloolaba's entertainment precinct when he got a call for help about 1am Monday. 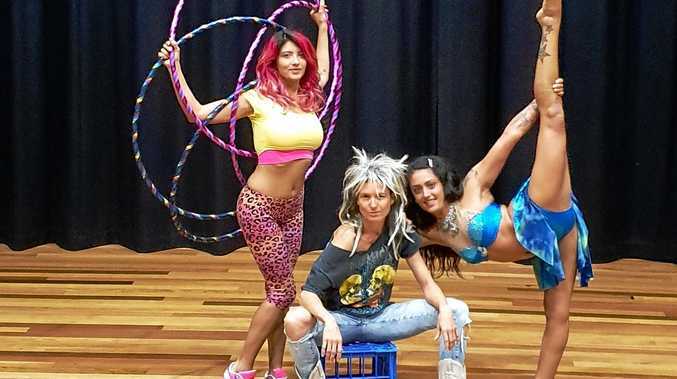 They were flagged down seconds later by concerned bystanders as they passed the taxi rank at the northern end of The Esplanade. "There was a young fellow with a pretty acute mental health issue," Snr Const Brewster said. The man, in his mid 20s, had initially been on rocks at the northern end of the beach but made his way down to the sand. "I jumped out (of the car) and was running with one of his mates. "He was quite a long way in front of me." Snr Const Brewster said he tried to talk to the man but he had made his way about 20m into the surf by the time he spotted him with torchlight. "I threw my gun belt with my partner. He stayed there." He said the man made clear his suicidal intentions. "You could tell by the way the other people were reacting it was fairly serious and he was not in a good way so I figured I had to try and do something." Have you ever been involved in a surf rescue? This poll ended on 19 December 2017. Yes, I was the one rescued. Yes, I helped rescue someone. I've never been in trouble or had to help someone. He said the water was "reasonably deep" by the time he caught up to the man. "I said 'mate, you've got to come back'." But the man kept going. "I was trying to take him but it reached a point where I had to grab him and drag him back in so he didn't hurt himself." Snr Const Brewster said he got the man back to waist depth when he broke free and swam back out behind the breaking waves. The water was up to Snr Const Brewster's neck when he caught him for the second time. "He dove away from me and I just managed to grab him. "He struggled the whole time. "It is hard enough saving someone who wants to be saved." Snr Const Brewer said the wrestle was leaving him very short of breath. "There were a few moments I was thinking 'dude, I'm getting pretty tired (and) I'm getting dragged under'. "It was getting pretty hairy." But he managed to get the man to shore and restrain him until paramedics arrived to take him to hospital. Snr Const Brewster moved to Australia about 15 years ago from his native England. He and wife Tracey, an Australian who he met in London, have three children aged 9-13. His six-year policing career has taken him from Caboolture to Longreach and then the Coast about a year ago. "I've got no real experience in the surf although I have swam all of my life." He said he had tried to surf in Sydney when he first got to Australia but had long given that away. "I flop around like a beached whale." He said the lack of experience didn't really cross his mind when he decided to charge into the surf. "In this job you do get exposed to fairly stressful situations and you do kick into autopilot." Snr Const Brewster said he was pleased to have been able to make a difference in not only the man's life, but also in those of the family and friends who cared about him. He was back at work yesterday afternoon for another night shift. "It was just good to get him back. "It is the kind of thing you sign up for." Anyone experiencing difficulty can call Lifeline on 131 114 or Beyond Blue on 1300 224 636.